Click through to win this S/S 2014 tote from George Gina and Lucy! Outfit details: Need Supply maxi dress, Cut 25 by Yigal Azrouel leather jacket, Rock & Republic heels, Yarley bracelet c/o Sheer Addiction, George Gina and Lucy Naughty Nadi bag (sample). Can you believe it's almost Christmas? Neither can we! This year seems to have zipped past. 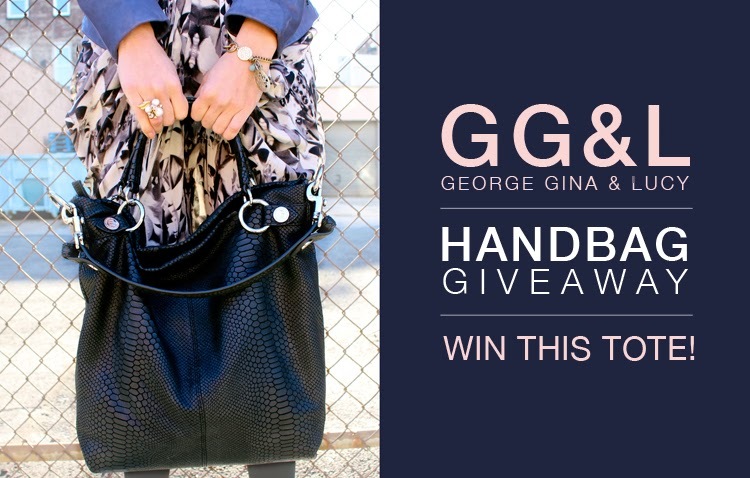 And to thank you guys for your continued support, we teamed up with handbag company George Gina & Lucy to offer a special giveaway on one of their new S/S 2014 handbags! We selected the Naughty Nadi tote (pictured here) because of it's chic shape and ultimate versatility. It's the perfect size to cram all your essentials into, and we love the croc-embossed pattern. I adore how Micol dressed it up here with a festive printed dress and rocking heels & leather jacket, but it would also look equally awesome worn with a pair of jeans. Check out the rules below to enter, and good luck! 3. Leave a comment below with your applicable username(s), email address, and whatever steps you took. Love the high heels! <3 Totally amazing! Fun giveaway! That bag looks perfect to house all of the essentials! Followed GGL and The Marcy Stop on Facebook under the name Francis Rie. Also followed GGLworld, Micol & Lauren on Instagram under the username francismonika. The Giveaway is a super cute idea for Christmas & the tote is amazing! Followed you, GGL, Micol and Lauren on Instagram under "flopo83", on facebook under "Simo Ch". Following GGL on Instagram and Facebook. Following the Marcy Stop on FB. Bonus: following Micol and Lauren on Instagram (@thetinyheart). I love GG&L. I already follow them I want to a pop up event they had a number of months ago. They make great bags and the event was so much fun. Following you guys now on FB. This GG&L handbag fabulous! As you said this design is really versatile and I could totally see it as my "go to" bag. You look beautiful! I love this neautral palette accompanied by the surprise pop of color in your heel! I love this bag, it looks so versatile!! I could easily dress this up or dress it down. I follow Micol (@nikkiimar) & Lauren (@nikkiimar) on Instagram! Wow! 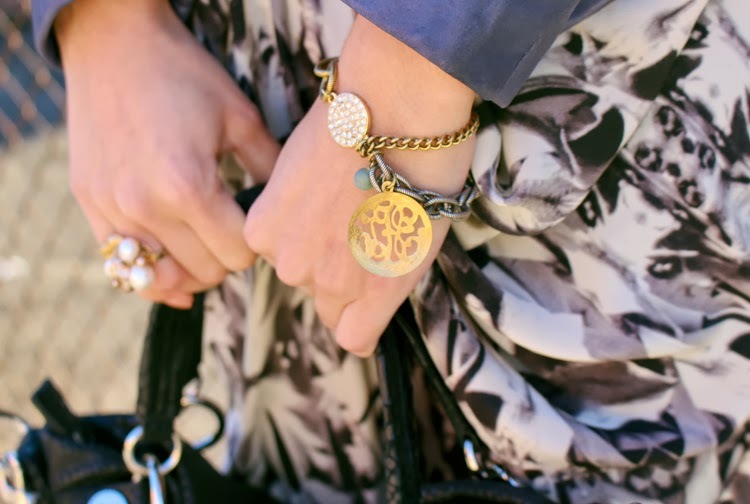 I love the GG&L "CosmiCurse" Style and this combined with the snake print - Fabulous! Beautiful as all GGL bags!! Like the look! Just my style! Also following GGL and Marcy on facebook! Love the Bag, love the shoes, the accessoires. It's really a nice outfit put together. https://www.facebook.com/becky.evans.31924 I like both accounts on Facebook. wow! love the bag and this site! i'm following the marcy stop and ggl on facebook. i would do the instagram thing if i could figure out what this magical instagram thing is and how it works. but, for the life of me, i have no idea. lol. Following GGL on Instagram (lvfrazier) and FB (highheeledstyle). Following The Marcy Stop on FB (highheeledstyle). Just found y'all today and glad I did! Followed GGL on Facebook and Instagram! As well as liked The Marcy Stop on Facebook and followed Micol and Lauren on Instagram! Love love this outfit in this post btw!! liked marcy stop + ggl on facebook as gaby schöps. e-mail addy: professor28 (at) o2online.de (swap (at) for @. Followed GGL and The Marcy Stop on Facebook. Following gg&l and the Marcy shop on Facebook as siobhan cornelius. Also following gg&l, Lauren, and Micol on instagram as @siobhancornelius. My email is siobhan.cornelius@gmail.com. I hope you're having an amazing holiday!! snazzy shoes, ladies! Only you could make Winter look this good. I'm obviously following you hotties on Instagram and now I've followed GGL world on Instagram and FB too! The shoes elongates your model figure, and the handbag brings out your hair color. Work the streets chica!!! Did all the steps plus the extra entries! Good luck ladies! I'am Glad to find this post! The women’s handbags are the most popular of women’s stylish accessories. These things more have function as a jewelry for a woman than their merely function as a bag. Thanks. I could not take my eyes off from your bag. I truly loved it. I will definitely buy one from the store where Louis Vuitton bags on sale. The whole outfit is stunning. The bags are simply stunning and the the whole blog looks beautiful and some of the most beautiful and stylish bags can be purchased online.